When it comes to creating images, beautiful and eye popping Color Schemes are very important to the overall branding strategy. As an interior designer I learned color is not just about pretty, but can impact humans on a deep psychological level. In this posts, I wanted to share 4 awesome free tools that will help you find beautiful color palettes for your designs that are easy enough for anyone without a degree in design to use effectively. Colour Lovers: A creative community where people from around the world create and share color schemes & palettes. Pro tip: Sort by ‘most loved’ to quickly find the best ones. Adobe Color CC: A service that lets you create colour schemes with the use of a colour wheel. Pro tip: Click the ‘Explore’ button to browse thousands of colour combinations from the Colour community. Coolors: A super fast color scheme generator with infinite possibilities. Just hit the space bar to generate a beautiful colour palette. Pro tip: Click ‘Browser’ to browse thousands of colour combinations from the Coolors community. ColorZilla: A handy Chrome or FireFox browser extension that lets you quickly read any color on a web page. With the help of these tools, you should be able to incorporate some great and impactful colors within your social media and digital marketing designs. In another future post, we will cover tips, tricks, hacks and apps to build those beautiful images; from Snappa to Typic and all those in the middle so that you can move from color schemes and selections to completed ad and copy in as little as five minute…seriously. What are your favorite Color Schemes & resources so we can add them to the list? Because the description is admittedly generic, written in general to be used by the most people, we HIGHLY recommend updating the bullet points slightly to reflect your specific company’s needs and expectations. Don’t forget to add the individual programs and apps used to run your company. We’re looking for a social media manager to grow our followers, engage and retain them, and help convert them into leads, customers, and active fans and promoters of our company. You should have command of best practices and trends in social media marketing, enjoy being creative, and understand how to both build and convert a digital audience. Build and manage the company’s social media profiles and presence, including Facebook, Twitter, LinkedIn, Google+, Pinterest, and potentially additional channels (Snapchat, Instagram, Vine, etc.). Run regular social promotions and campaigns and track their success, ranging from Twitter chats, to Google+ Hangouts, to LinkedIn conversations, as well as the content and links posted through these and other channels. Work alongside other marketers and content producers to help distribute content that educates and entertains our audience. Explore new ways to engage and new social networks to reach our target buyers. Active and well-rounded personal presence on social media, with a command of each network and their best practices. Proficiency in social media schedulers like Hootsuite , MeetEdgar and HubSpot. You will be our ear to the ground to route the appropriate marketer, sales rep, and/or support rep to social conversations. Bonus experience and skills include pixel creation and use, Adobe Creative Suite, Snappa, demand generation marketing, inbound marketing, content creation, market segmentation and blogging. These days, visual and written content is so critical for capturing people’s attention. Whether it is with a well-designed ebook or a snazzy infographic, you will quickly learn that marketers who are leveraging content are seeing significant increases in their blog traffic, social media engagement, visitor-to-lead conversion rates and inbound customer acquisition results. Downside: content, especially visual content, takes so much time or money to make. Want some free templates to make your life easier? Save time by using these free templates from HubSpot to create beautiful ebooks and infographics quickly and efficiently. Infographics are a powerful tool for capturing the attention of your target audiences. In fact, businesses that publish infographics grow their traffic an average of 12% more than those that don’t. The hard part, of course, is finding the time and resources to create these infographics. That’s why we’ve created fifteen fully customizable infographic templates that will give you the inspiration and foundation you need to build your own infographics right in PowerPoint or Illustrator. Use these infographic templates to present data for your next meeting, promote an offer on social media, or in your next blog post. Visual information is becoming more and more popular — and now you have the resources to easily create this visual content. And remember to pass these templates along to your friends and colleagues, too…we promise they will thank you! Facebook is quickly becoming the predominate and preferred advertising platform, but what about your day to day Facebook posts? More often than not, it happens that you become a bit more restless and over think everything when your online presence doesn’t increase despite your repeated attempts at creating quality content and even sharing it among your friends. Some even take a step forward and move towards sites which offer points which you can redeem to get likes, comments, or any other type of engagement on your social media such as Facebook. Controversial topic: Don’t get us wrong, by posting controversial topics as Facebook posts, we mean hot button topics in which many people have a strong difference of opinion so they can state theirs and have a healthy conversation in the comments section. It should also be noted that these type of posts should only be put out occasionally, when the time is right, so a positive image of your page regarding current matters is appreciated. Photos: It shouldn’t be a surprise by now that posts which contain one (or more) relevant images are more likely to gain attention from the people. Why? Since a lot of users don’t bother to read because there’s a lot of it already from other posts. Plus, it just doesn’t stand out. The appropriate picture can actually catch the attention of the user interested and get them to comment/like on your post. Something Unique and New: Perhaps the key in making your posts the most interesting Facebook posts out there is a new and novel idea or thought. Ideas do fail, no doubt in that, but assessing your idea, giving it some thought, and applying it into a post/article with a relevant image is the perfect recipe for getting a post with a lot of views/like/comments. Monotony is present everywhere, it’s the innovation which gets respect. Tips: Even though there are popular pages such as LifeHacks which specialize in providing day-to-day tips, making your own tips that go deeper into the subject that your page/posts cover is an essential way to get people who are specifically interested in this field to engage on that post. This way, you stand out from the crowd, and also become the hub for a lot of organic traffic. To get 365 Days of Facebook Post Ideas to download with full copy/past scripts, visit our download page and submit your email for confirmation here. For additional blogging tools and tips, visit Business Growth Network for more information. What kind of Facebook Posts styles are you utilizing? When you hit a wall, don’t keep running into the wall to prove a point. Give us a call via Skype or FaceTime for a 1 hour Coaching Call and I can help you personally work through the issues complete with a follow up email with notes and links that we discuss. But help doesn’t stop there! I found that after giving direction, once you get into the weeds, you have more questions! We’ll follow up and schedule a time a week later for another 1 hour call to discuss where you are at and where you are having troubles. In addition to the two hours you have with me on the phone, you will have 3 months with full access to our online membership portable with more downloads, video tutorials guides and more! Ask questions and get answers in the sidebars or go to our Facebook Engagement Group to network and ask other members (including us) for what they are doing that is working. Below you’ll find a secure checkout form that will allow you to pay with your preferred method as well as signup for 3 months access to the SocMe Vault with lots of cool tools and tutorials! Ensure you input your best email as this is where I will reach out to schedule our coaching call. We are kicking off and launching our blog and brand with the 31 Days to Blogging Success. Complete with printables, downloads, plans, ideas and all the info you need to get started building a blog that connects you to brands that gets you paid! Of course, building your blogging empire alone can seem downright scary. Luckily you don’t have to. Over the past 3 years, I’ve built dozens of blogs for myself, companies and other bloggers with incredible results. And while the challenge was pretty good, and definately effective, we are streamlining the process down to 31 days with printables and downloads for your convenience. Beginning January 1st, we invite you to join the new and improved 31 Days to Blogging Success! For Bloggers, simply sign up here to have our daily challenges for growing your infulence sent to your inbox each day. Business looking to grow their markets and reach out to bloggers, sign up here. Join our Facebook engagement group to interact with other bloggers and brands to help the community grow better together. Please do read the rules though, as spam posting will not be tolerated. Also, be sure to check your spam, if you use Gmail, your “promotions” folder for an email from me, Jena Apgar, and if you don’t see the email within 15 minutes, please email us at jena@missjena.com. Weekly Calendar to Keep up with both your daily schedule and your social media postings. Great for whipping through your To Do list and keeping track of your network and blog sharing. Creating a Media Kit: Do you need one? How to build one and even a FREE fill in the blank template! We will be updating this page daily to add links to our 31 Days of Blogging. Overnight, while you slept soundly, thousands of dollars came pouring into your checking account because you made money blogging your life’s story. You’ve literally made money in your sleep. What’s the secret to this “Everyday is lazy Sunday” lifestyle? But don’t get too excited so easily. There are no overnight, quick, get rich schemes here. What I have complied is a list of ways to make money utilizing your blog, that with work and effort, can bring you to a full time income even without viral success. Below is a comprehensive list we will keep updated of monetization avenues rated 1-5 $$$$ based on time and profit capability and listed in order from easy to the most difficult. Before getting into the details, there are a few things I should get out of the way. First, results may vary. What works for a cooking blog would almost certainly not work for a startup blog. Those little ads appearing in your sidebar to earn you money charged by click through rate (CTR). This is the most common, first step for a blogger and unless you are seeing 100,000 a day, a terrible waste of your time, efforts and precious sidebar space. Google Adsense is usually the typical starting space for almost every blogger I’ve met and yet only produces pennies in return for cluttering up a beautiful space. I’ve made money at www.MissJena.com through AdSense, but very little through Pay Per Click ads – all through YouTube videos which I will discuss further down. The average CTR is just 0.1% and you get an average cost per click of $0.05-0.50 cents. For every 1,000 visitors, you can hope for $0.50 at best. Waste of time. Plus, there is usually a minimum threshold of $100 before the company will send you a check in the mail. Another downside to blog ads, it that your flighty new visitors are now down away web surfing instead of focusing on your content. You’ve spent all that time, effort and careful attention to create great content, only to lose it to the national company with professional marketing teams, and all for maybe $0.50. The upside, it’s the easiest and least time consuming monetization method on this entire list. Similar to an ad, companies like Taboola will give you code to add to the bottom of each blog piece that redirects your readers to other sites to read using “Recommended” content. You face similar issues like the Blog Ad, but it is an option. These are the blog ad, but they automatically link particular words in your content. I find these even worse than blog ads. They don’t even always direct your reader to something that makes sense given the text! And they might direct your reader to products or links that can be offensive or suedo-science crazy pills. Worst…you will probably make less money that with the blog ads. These perform better on sites that get large volumes like the Huffington Post. There are several ways to do this to make money blogging, and there are many bloggers who have found great success with this style of monetization. One is affiliated shopping links with companies like Rewards Style, Shoppable, and Shopstyle Collective (formerly Shopsense). Your blog is just a means to get traffic – people really miss that point. You don’t just post blindly – you post so you can tap into new traffic sources and constantly grow your reach. There’s no point in having 10,000 visitors every day if they are interested in your end-product. Some of these companies will have you go through an application process and have certain standards. Some of the ones we have come across are, monthly page views, unique visitors, picture quality, graphic design quality, number of blog posts, social media reach and even location. This helps them choose bloggers that are the best fit, but also lure new bloggers into purchasing followers and visitors that often get them into trouble. 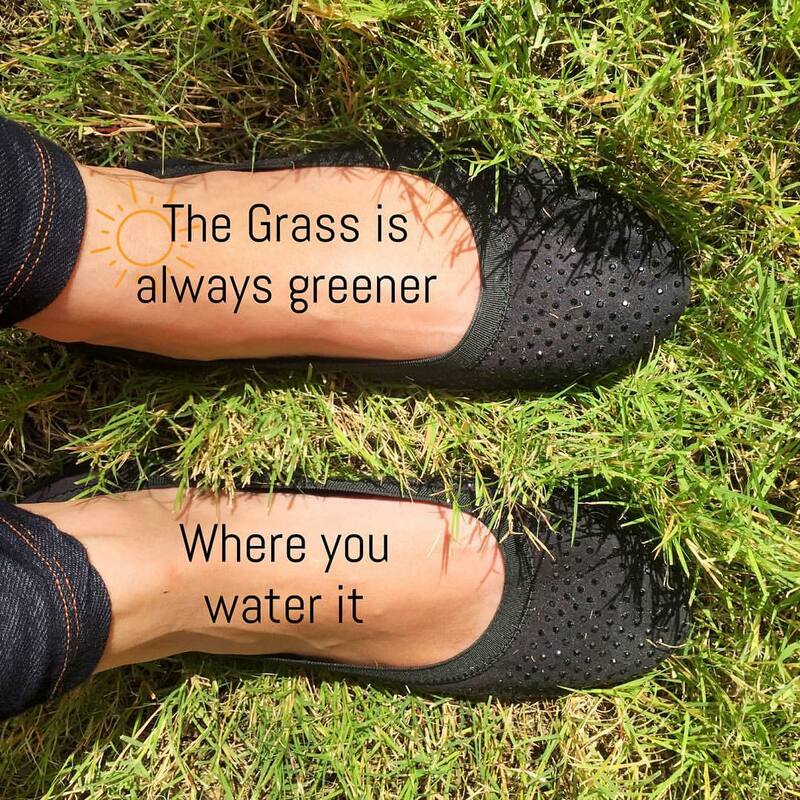 Quick Tips for Blogger Application Success: 3 blog post a week, great images that are sized to fit the blog post completely from left to right, and combining your blog efforts with social media. The other way to sell someone’s product is direct campaigns with stores and business on a per contract basis. This can mean hosting a soiree at a boutique or working with an internet affiliate company on a specific campaign tailored to your audience. This takes more effort to reach out to clients and can be combined with the “Monetize Your Unique Skills” below. Treat affiliate marketing as a way to maximize profit, but not the foundation of your monetization. The way to build your business and income is for YOU to get the customers. Banner ads and affiliate marketing send your visitors off to somebody else. For that reason, it isn’t the foundation of a good monetization strategy. This one marries well with Affiliate Marketing. Basically, you earn commission and/or free products from reviewing products, creating tutorials, and recommending products you use daily. This is a perfect strategy for the part time, in college and stay at home mom crowd. An Amazon Prime account will become a necessity. Note: Only promote products you have used and believe in personally. When doing this, it is important to disclose the fact that it is a paid review. It is also important that you maintain your integrity and never give a positive review unless you’re really feeling it. This can include what many bloggers might know as the “Sponsored Post.” You get paid (or not in the beginning) upfront to review a product and tell your readers about it. Depending on your traffic and exposure, you could make something between $5 and $5000 per post. Price is completely dependent on your reach, how many mays and platforms you will promote on and for how long. You can do more than blog! Put your skills to good use and advertise YOUR OWN services on your own blog. This could be knitting, reviewing products, small business social media marketing strategy, or even proof reading resumes. So many ideas just waiting for you. I personally prefer this option because you always sell more of something you created yourself, plus there is wonderful sense of fulfillment I get when I see my client companies succeed. According to our research, the bloggers who reach six figures in revenue the fastest begin with some type of coaching or consulting service. Unlike creating courses or writing an e-book, there’s no preparation. You can decide to start selling coaching services and have your first client by this evening. In addition to being able to market yourself on your blog, this service will give you ideas to write about. The blog will act as a way of giving back to your clients and act as lead generation to future clients. One way to tip toe into this arena is Fiverr. Jobs start at just $5, but can be simple. Not only is this a great way to test the market to see what customers are buying, but it is a fantastic lead generation tool for those with services that can be done via the internet or shipped. Sale and advertise your own product! What if you made money blogging by selling blog planner printables? Books and eBooks are very popular products. If you can create premium content for your readers, they will be highly likely to buy your book. They are fairly easy to create these days and Amazon is happy to help you sell it too!. Plus you’ll make more money than if you just shoved ads on your blog. EBooks are the ultimate authority builders, trust builders, and branding tools for building an income generating blog. Inevitably if you want to make a lot of money blogging, you need your own product or service. This allows you to control the marketing, the price, and take 100% of the commissions. And from start to finish – Focus on growing your mailing list. Your profit can and will be directly related to how many people you can reach directly and personally. Did we miss one? Do you make money blogging? What are your tips for newbies? Day three of the #write31days October challenge and glad to see you still here with us! Please ask any question you might have in the comments section below and we will get to it in a day or two’s time. 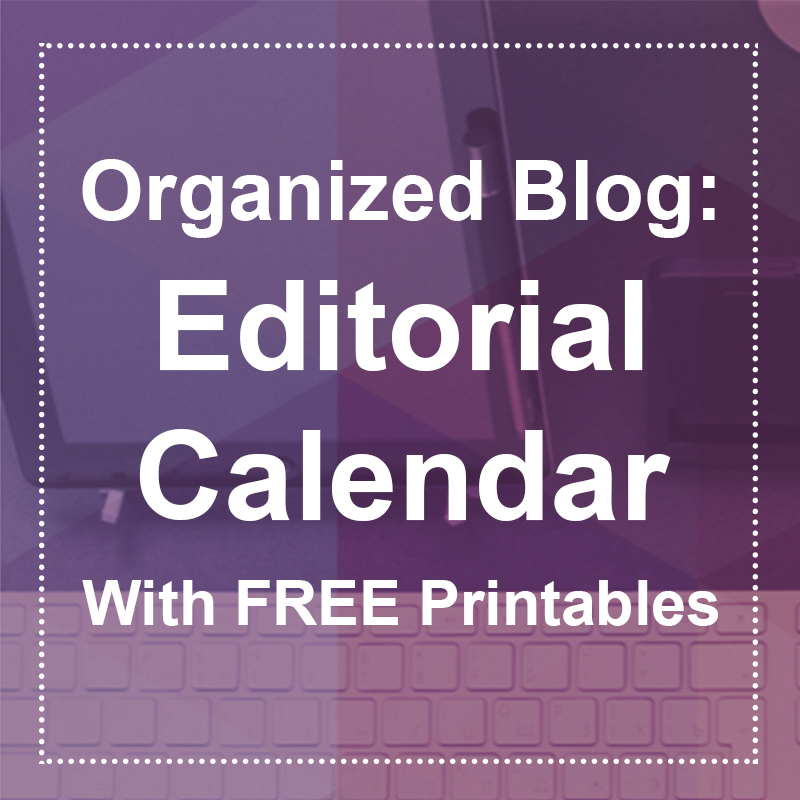 Today we are discussing the need to have a blog editorial calendar and created a FREE editorial calendar download at the bottom of this post! For content to your inbox, sign up as a brand or blogger, and we will deliver this same info right to your inbox, plus sweet extras! We have created our own blog editorial calendar because many on the internet just didn’t fill the need. Lots of the printable calendars we found were too girls and not usable for me, only offered a week at a time (too much printing) or super brightly coloured (too much ink wasting), focused on insignificant details that were not going to help monetize a blog or redundant information to the weekly calendar. Mapping out and prepare posts beforehand is just one benefit. This will help solve two things immediately: One, more ideas on what to post about so to avoid writer’s block and two, help visually space out the types of content you use to keep things interesting. This helps to schedule regular material, guest posts and keep sponsored posts on deadline and timely to holidays and seasons without sitting on top of one another. The editorial calendar provided covers one month with blogging availabilities for every day. Print out 12 and fill in the dates and months. How many days a month do you want to post? You can start to map out your entire year coordinated with events and holidays. Current event pops up? One glance tells you where you can post and if you need to move blogs around a bit. Keep post topics varied and consistent. Next week, we will post our personal, closely held list of blog post types and ideas to help through those mental dry spells. Sign up so you don’t miss out and we will send the information directly to you! In the bottom right corner there is a space so that you can have a look at your blog stats and traffic and make notes as to any days with particularly high visits. This becomes a great gauge to see what people come to your blog looking for in real life.Soon you can start developing a more honed blogging direction based on what you know works well for you and your readership. Next to this is a Top referral list. When you track pages, you can also track who is sending traffic your way (ex: another blog, Facebook, organic Google search, paid advertising). Take care of good referral contacts! I’ve tried to make this calendar pretty self explanatory, but if you have any questions, utilize the comments section below this post. 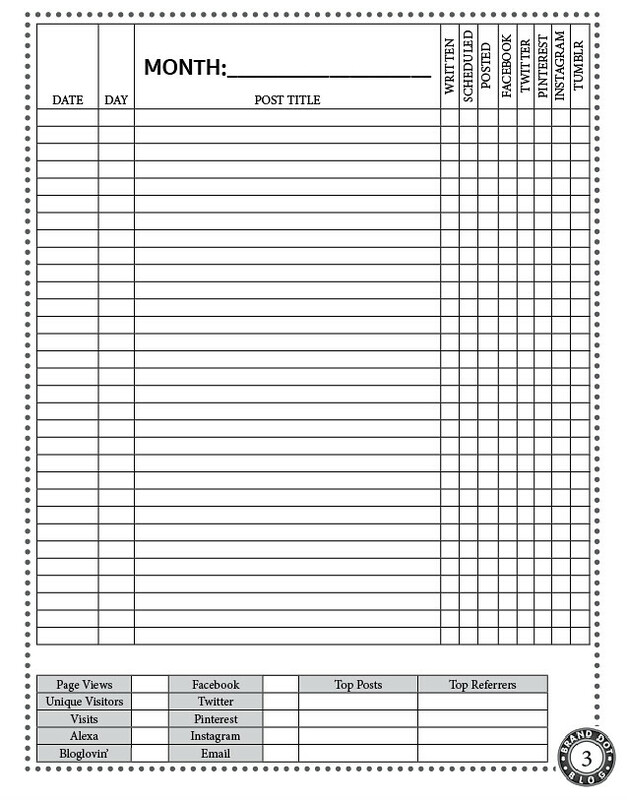 The editorial calendar is created in a dark grey for easy and inexpensive printing and designed to be utilized by both men and women. You can download BrandDotBlogs Editorial Content Calendar here or by clicking on the image below. I recently coached a food blogger who reached out to me having issues finding and working with brands. Most puzzling to me was this blogger was a Brand Manager himself! With all his years of professional experience in the coprorate side of brand management, he still didn’t know how to reach out to companies for paid blog work. So this list is highly persoonalized to his and my personal coaching session, but I wanted to share it quickly for others struggling. Fiverr.com – this one you have to set up “gigs” but for everything you do you make $5 to start. My typical minimum order these days is $25 plus the product and many orders go much higher. I have found several regular clients this way. If you get started, let me know and I can connect you to the client with the apple peeler. A real time saver, but more expensive, is MeetEdgar.com which after you have created the material, will keep posting your social media content so that you never have to worry about forgetting. Focusing on bringing in the consumers with a visually impactful site, social media and content and more and more companies will find you, but don’t forget to make it easy for them to find you with key words like ‘food blogger’ in your SEO and content, descriptions, headers and image alt tags. Cultivate your clients. even if you are getting paid nothing. Many small clients want to see what you can do before giving you bigger projects. Use LinkedIn.com to promote postings in a way that reaches out to marketing professionals speaking you out as a food blogger.